It's been going on long enough now to call it tradition. 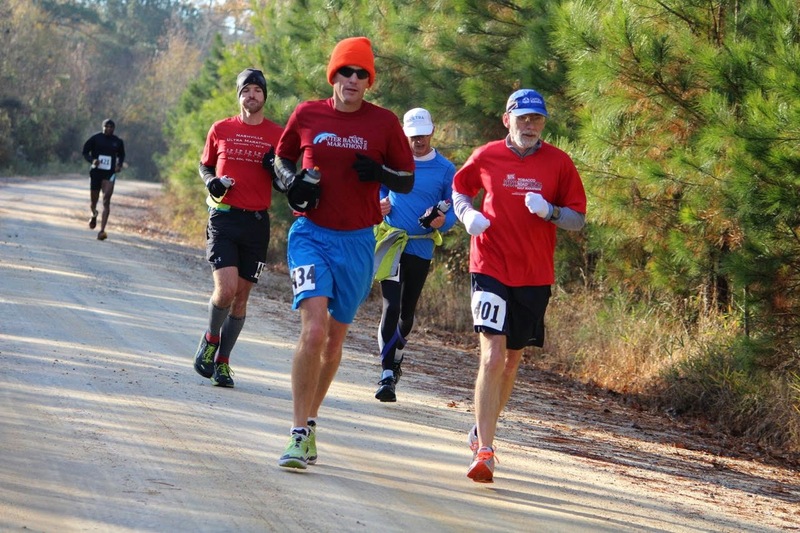 If it's Thanksgiving weekend it is time to head South for the Derby 50k. 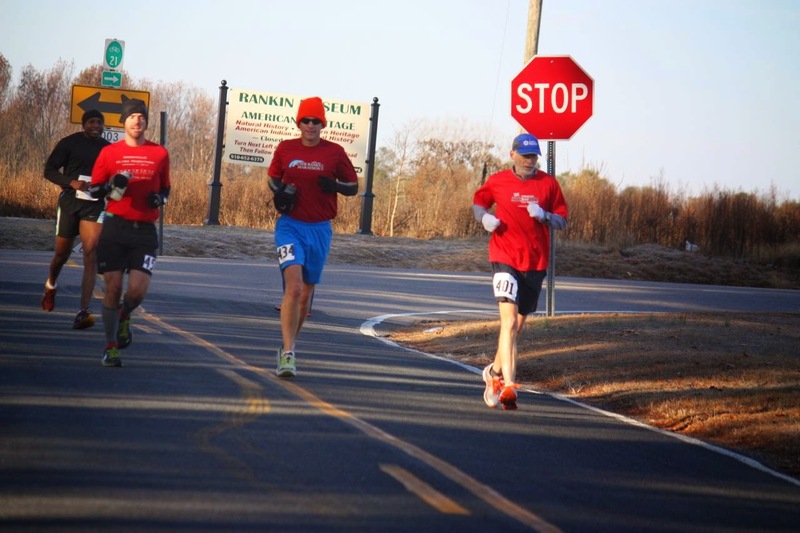 This year I would be going for my 11th consecutive running of this little gem of a race in the tiny Richmond County Community. ( The race crosses into Montgomery County each of the 3 loops). 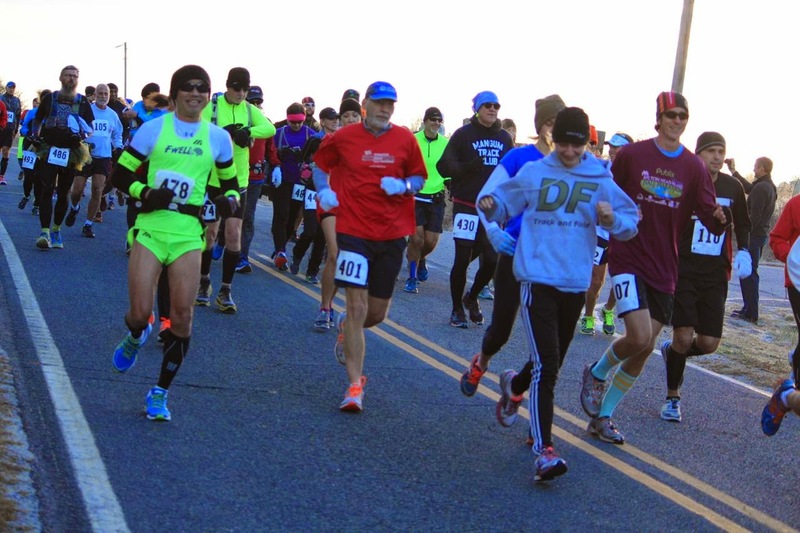 Over the years I have set pr's, run with friends and sometimes suffered but always enjoy the great atmosphere of this low-key Mangum Track Club Event hosted by Mark Long and some awesome volunteers. It's a 3 lap course in a very rural area with rolling hills so although it is a bit challenging it can provide an opportunity for some fast times as well as be an event for first time ultra newbies and each year there is a good mix of first timers and veterans. I arrived around 7:15 and spent the time before visiting with many friends that always seem to be there. Coming into this years event I knew going in that a pr was way out of the question since I am not back to 100% from the injury and it would take that at this point for me to have a shot at it. So my plan this year was to have fun, get in a good long endurance workout and hopefully not crash and burn. But I am a bit of a dreamer and miracles do sometimes occur so I was ready for anything. The weather this year was looking perfect. Start in the mid 30's and warming up to about 50 with only slight wind. I lined up with the idea of just running how I felt, no pushing the pace but no walking either for the first lap and then re-assess the situation. I started off easy over the first hill just past the start and then settled in to my comfortable normal easy run pace on the gentle down hill to the mile mark. I was a bit surprised it was about 8:40 since it felt a lot easier than that. Everything was feeling good and around the 1.5 mile mark I fell into pace with Mark Johnson, Justin McLamb and Walt Robinson. We were having a great time chatting as the miles passed quickly. I had no need for anything from the aid stations so I just kept cruising on by and feeling good. Just past aid station two, Justin and Mark began to pull away and I had no desire to chase them and wear myself down so Walt and I continued on sharing the beautiful morning. I was still feeling pretty good and the pace was a bit faster than my pr pace. We ran the mile long hll from 8 to 9 in a decent time but by mile 10 I could tell I was going to be in trouble if I kept up that pace. 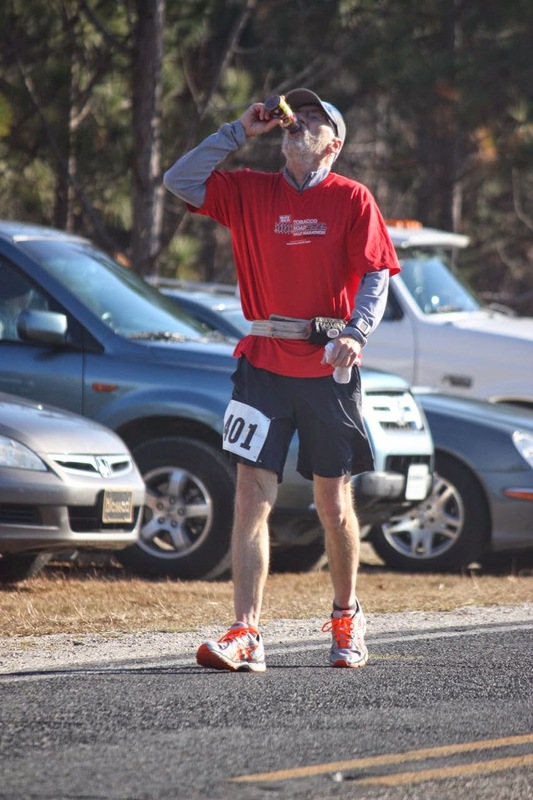 As we came into the first lap I stopped at my car just long enough to grab my water belt and a protein drink and walked through the aid station while I drank it. Walt had gone on ahead so I was going to be spending the remainder of the day alone as things were very spread out by now. I am not always the smartest in these ultra's but I headed out on lap two planning to run/walk the hills and hopefully not blow up. I was getting a bit tired and had another 21 miles to go. I had about a minue cushion over pr pace but that would be gone quickly ! A mile later I was getting a low battery message on my garmin which surrprised me since I had just charged it two days before and not used it. Oh well. I continued on doing the run/walk as planned. Nothing was hurting but I was a bit tired. Passed by aid station one and stayed only long enough to take a gel and moved on. Same thing at aid station two. Going up the mile long hill was a lot harder this time around and slower with the run/walk but I go it done. I finished up the lap same as before with a quick stop for another protein drink and drank it while Mark re-filled my water bottle. As I headed out on lap 3 I was a bit surprised to have a bit of a resurgence of energy and a little zip in the legs. this was a good feeling so I just went with it. My pace over the next couple of miles was close to what I ran the first lap but then of course I was still doing some walking on the hills so I was going to be a lot slower overall. Stopped at aid station one again just long enough to take a gel and thank them for being there and then took off on Sycamore Lane, may favorite section of the course. 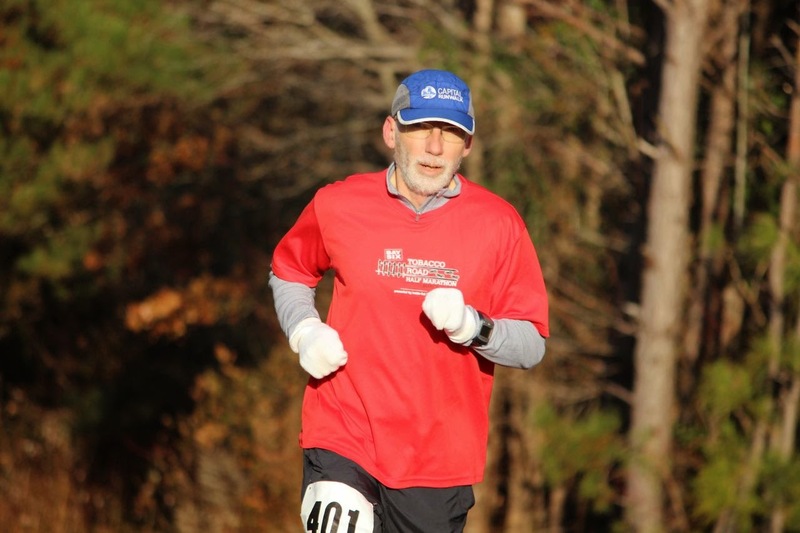 I tried to run as fast as I could on the slight downhill and passed the marathon point in about 4:23. I was quite happy with that because that was 25 minutes faster than my time at the OBX Marathon just 3 weeks earlier and I was still feeling pretty good. But I was slowing down by the time I hit the dirt road. As I came into aid station two for the last time I took a gel , thanked them and headed out saying I only had 5k to go and anyone can run a 5k right ? But there was that mile long hill into a slight wind to contend with once again. It was slow but I got to the top and it was mostly easy cruisng from there. I ran strong to the finish in 5:22:48 which was good for 19th out of 69 finishers and 16 minutes faster than my time last year. My last lap was actually 3 minutes faster than lap two so that made me happy too. As always, afterwards I went inside to enjoy a delicious sphagetti dinner provided by the local church ladies and visit with friends that had finished. Once again a wonderful way to spend the Saurday after Thanksgiving. Thanks to Mark and the volunteers and if nothing happens I will be back next year for # 12 ! Thanks to Kevin Spradlin for all the pics.